DUEL project launch- Laughing all the way! Last month, DUEL (“Disfluencies, exclamations and laughter in dialogue”), a joint project between the Bielefeld DSG and Université Paris Diderot (Paris 7) launched in Paris. The project aims to investigate how and why people’s talk is filled with disfluent material such as filled pauses (`”um”, “uh”), repairs (e.g. “I, uh, I really want to go”..), exclamations such as “oops” and laughter of all different kinds, from the chortle to the titter. Traditionally in theoretical linguistics, such phenomena are rendered outside of the human linguistic faculty, an opinion held since the dawn of the modern field, particularly owing to Chomsky’s early performance and competence distinction (Chomsky, 1965). However, as Jonathan Ginzburg and our own group head David Schlangen claim in their recent paper, disfluency is analogous to friction in physics: while an idealized theory of language can do without it, one that purports to model what actually happens in dialogue cannot throw these frequent phenomena aside. The project aims to investigate the interactive contribution of the disfluency and laughter that fill our every conversation through a three-fold attack: empirical observation, theory building and, of course, dialogue system implementation. The project aims to investigate how the phenomena vary across languages and use the insights gained from data analyses and formal modelling to incorporate them into the interpretation and generation of a working spoken dialogue system. We aim to build a system that can be disfluent in a natural way, and is also capable of interactionally appropriate laughter when interacting with users. 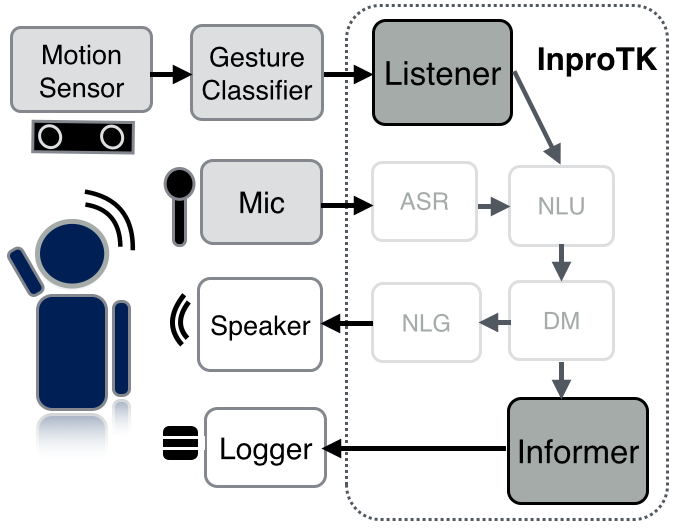 These are milestones for moving towards more natural spoken conversations between humans and machines, which despite the recent questionable press claiming this has recently leaped forward, is still a far-from-solved problem. You can follow the progress of the DUEL project on its new website. Which- uh, I mean, haha, watch this space..